Bahira was born in Saudi Arabia of American parents and was raised in the Middle East up until the age of 20. Her study of the art form of Belly Dance began after she had been in the U.S. for some time, but she fondly remembers dancing freestyle to oud and drum in front of Bedouin tents in her youth. She is self taught, having learned the basics from a book and for the most part, she dances from the heart. Her first Belly Dance teacher was Marta Schill (former president of MECDA) but Bahira is also a keen observer of other dance techniques, absorbing and transmuting what she sees into her own style. "I am a Gypsy, in the true meaning of the word: I am a Wanderer through the dance world and I take what it has to offer and make it my own. My goal is to entertain audiences and unleash the joy and fun to be had for all of us." Bahira got her first taste of troupe performing with Alcina's Bennuvians for over 6 years and found great joy in creating choreographies. 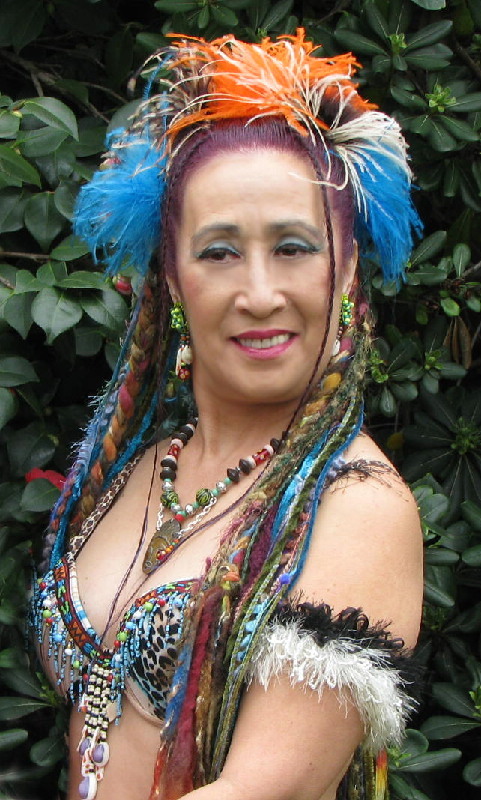 With her good friend Mandella, she co-created Troupe Nambah in 2001 performing at Belly Dance, Art & Wine Festivals and Restaurants until 2008 when the troupe was retired. 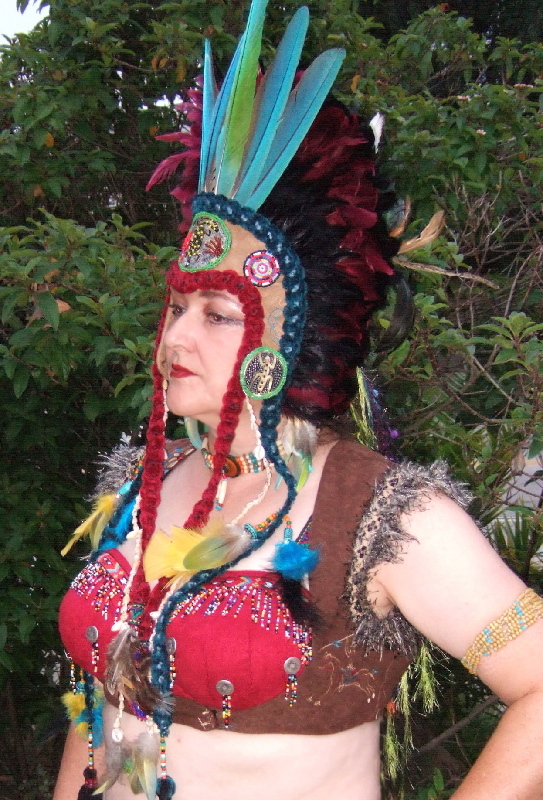 Bahira created her second troupe, Indigenous in 2005 to pursue her Gypsy nature into imaginative and non-Middle Eastern dance areas with others interested in expanding their scope and range of Belly Dance. Bahira lives in Santa Clara, California with her husband, David, her son, Douglas and two crazy cats named Calie and Sallie. She is a chef, writer, costume designer, drummer, choreographer and Domestic CEO as well as dancer and hopes to continue doing all these things until six weeks after she is buried! Fara'Asha was born and raised in San Francisco and as such was exposed to the many fascinating cultures that the City By The Bay holds. It has cultivated in her a love for music of all types. She fought with her mother through many sessions of piano and violin practices, but those lessons gave her a solid foundation in music. Fara'Asha came into belly dancing later than many. Single parenthood, returning to school, and joining the work force didn't leave much time for outside activities. A friend suggested a belly dance class for fun and fitness and Fara'Asha was hooked. The rhythm of the music, the movement of the dance, the beautiful costumes and the camaraderie of the Belly Dance community all captivated her. Taking classes first from Kamilla (where she met Bahira) and then from Alcina gave her courage to step out from the workday world and into the limelight. Fara'Asha, Bahira and Shiva are all previous members of both Troupe Nambah and The Bennuvians where they refined their talents in group choreography. Fara'Asha's name means "butterfly" and she has definitely achieved her transformation into a beautiful butterfly free to explore additional cultural interpretations of the Dance. Shiva was born and raised in San Jose, California. As a youth, gymnastics and modern dance enabled her to express her love of movement, rhythm and flexibility. When she turned 21, wanderlust caused her to explore Montana, Oregon and California where over a span of 13 years she learned the art of Belly Dancing from Habiba of Los Angeles and Badwia of Portland, among others. Financial struggles forced her to return to the Bay Area for work but she continued her study of Belly Dance from Jamilla Solampour and her then 16-year old daughter Souhaila of San Francisco as well as Una in the South Bay. Shiva found great joy in blending the art of Belly Dance with her love of bodybuilding and physical exercise. Then a horrific injury to her hip during a bodybuilding workout crippled her for seven years, leaving her unable to walk, much less dance. During this disability period, she learned Native American flute and drum as well as Middle Eastern drum (Doumbek) enabling her to keep in tune with her dancing spiritually while her body mended. 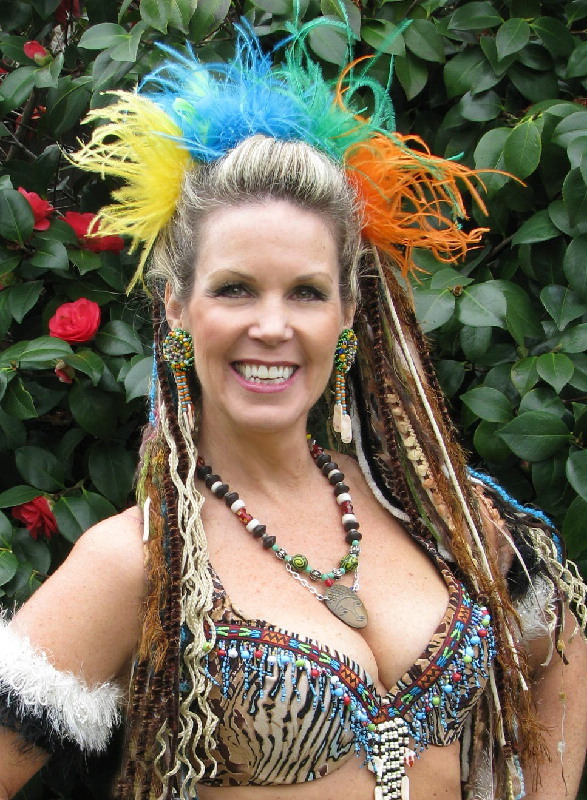 Surgery was finally successful in restoring her mobility and after a year of intensive rehabilitation, she resumed her passion for Belly Dance taking classes from Alcina in Sunnyvale where she hooked up with Fara'Asha and Bahira. Shiva continues to stretch her dancing skills and uses her incredible flexibility and balance in unique ways. She looks forward to the new interpretations that Indigenous will add to her already amazing performances. Sevanti grew up in Joliet, Illinois, a town about one hour south of Chicago. Her mother started her early in the dance world, enrolling her in Ballet and Tap when she was 3. It was the beginning of a still ongoing battle by her mother to turn the would-be tomboy into a "girlie girl." Sevanti would fight for hours against wearing a dress, but she did continue with dance, learning Jazz and Pointe as well. In Illinois Wesleyan University in Bloomington, Sevanti was undecided between musical theater and chemistry as a major, a dichotomy to be sure, but one that exercised both sides of her brain. She chose to be a chemistry and physics major, but took all the dance classes she could fit into her busy schedule. In grad school at the University of Illinois at Urbana-Champaign, Sevanti continued Tap along with her studies in Inorganic Chemistry. When she moved into the bay area to work she searched for another form of dancing and happily found Ballroom dancing offered at her job over the lunch hour. 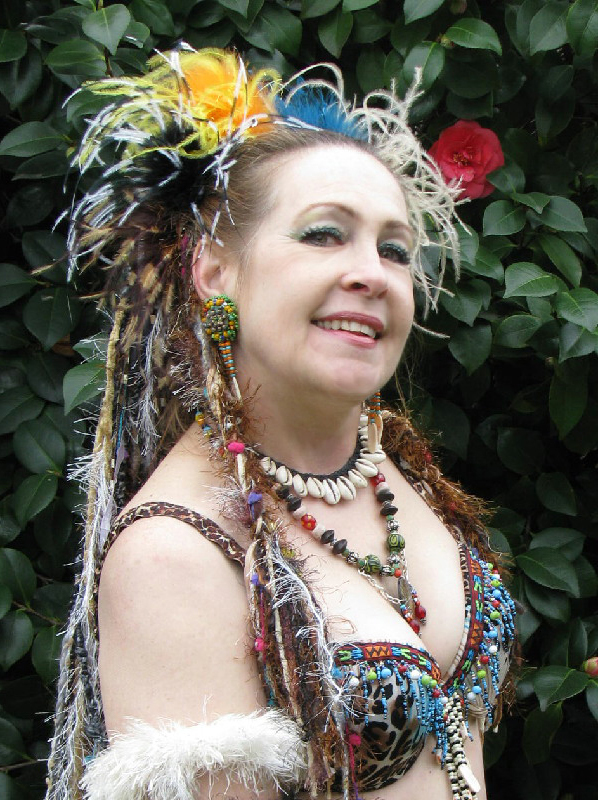 A co-worker introduced her to the world of Belly Dance in 2002 and Sevanti liked the idea of not having to always find a partner with which to dance. Belly Dance was a dance form she could perform solo and that was really neat. She gave it a try and found that fit in perfectly with her love for different types of music. 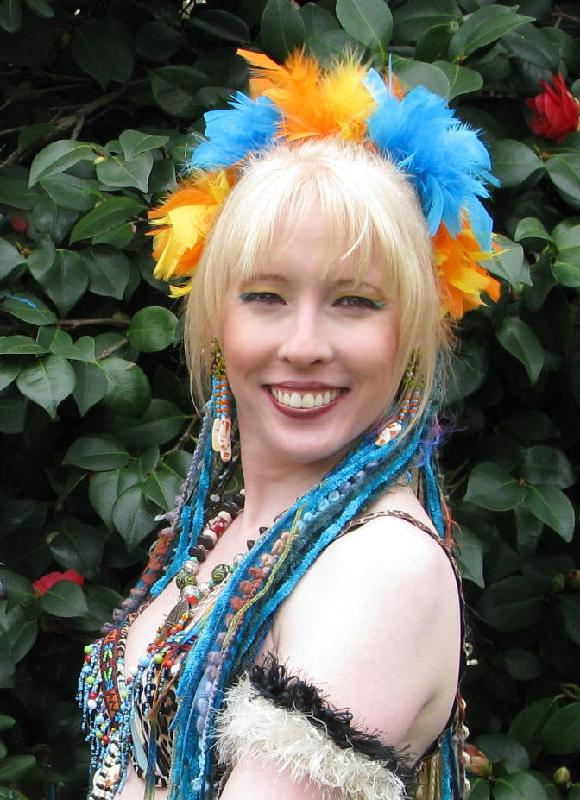 Sevanti's artistic goal is to learn as many different "languages" of dance as possible and she has now added Belly Dance to her solid dance background. She has taken Belly Dance lessons from Alcina, Maia, Zora and Bahira and brings her modern dance aspect to this ancient dance form with eye-catching sparkle. Sevanti is happy to join Indigenous in its desire to expand the boundaries of the Dance and is looking forward to learning from the other amazing members of Indigenous. Sevanti currently lives in Boise, Idaho with her new husband, Alan, and commutes monthly to practice with Indigenous. She continues to search for new aspects to express the way that music moves her. Aniq was born in San Carlos, California and now resides in the town of Campbell. As a child she had a great love of music and dance, which became evident at an early age when she would gather her neighborhood friends and choreograph dances to perform for parents and friends. Gymnastics and modern dance dominated her pre-teen and teen years into adulthood. A lifetime of fitness and dance eventually lead Aniq to Belly Dance, which she fell happily into in November of 2007. She has been captivated ever since. Aniq is an elegant, yet energetic dancer, and in fact her dance name Aniq is the Arabic translation of Elegant. You can see by the smile on her face that this Dance brings her great joy and happiness! She has studied with Zora, Hala, Saiqa and presently, Saida with whom she is a member of troupe Rakset Wadi al Shems in Willow Glen. Shiva, Fara'Asha and Bahira discovered Aniq while performing at a Halanda Studio recital and mutual admiration lead to her being invited to join the Indigenous tribe. Her energy and enthusiasm for new ways of celebrating the Dance will add to the tribe's dynamic spirit. With equal exuberance, Indigenous welcomes its newest member, Aniq. She debuted with Indigenous in 2009 at Rakkasah West in Vallejo, California. For Zora, belly dancing was a celebration of the strength, beauty and sensuality of the feminine. “So many of my needs were satisfied by participating in this celebration—acceptance, appreciation, belonging, cooperation, community, consideration, consistency, inclusion, respect, support, trust, joy, humor, inspiration, challenge, competence, contribution, creativity, discovery, growth, learning, purpose, self-expression, stimulation, understanding—and exercise too.” Zora brought true Native American spirituality to the Indigenous tribal sisterhood and continues to support the tribe with her creative sewing skills. She will always remain an honorary member of the Troupe whether on the stage or behind the curtain.